Apple paves the way for the iPhone of the future. As announced Mark Gurman at Bloomberg, known for always guessing right on its forecasts and rumors about upcoming iPhone, the company is working on a technology that will allow you to control the phone without touching it, through gestures. It will not be the only great novelty that they prepare in Cupertino. Knowledgeable sources of the developments assure Gurman that Apple will use a curved panel in a future model of the iPhone. The control feature would allow iPhone users to perform some tasks by moving their finger close to the screen but not touching it. Of course, this technology probably will not be ready for consumers for at least the next two years. In addition, the company must decide if it is worth it or not to fully develop it. Apple has always been characterized by adopting new ways for humans to interact with computers. Its co-founder, the mythical Steve Jobs, popularized the use of the mouse in the early 1980s. Both Samsung and Microsoft have already implemented a similar technology for years (with the Galaxy S4 and with Kinect and Windows Phone, respectively), but it will be very interesting to see how Apple implements it and if this encourages more manufacturers to develop their own systems. The latest Apple iPhones have also had a function called 3D Touch that responds differently depending on the different pressures that are performed with the fingers. The new gesture technology would take into account the proximity of the finger to the screen, according to sources of the company cited by Bloomberg. At the same time, Cupertino is also developing iPhone screens that curve inwards from top to bottom. The iPhone X was the first mobile of the company to incorporate an OLED panel, but the company has in its plans to change this technology for a new call MicroLED within 3 to 5 years. 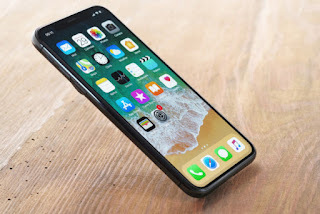 However, before making that leap in technology iPhones would begin to integrate curved screens from top to bottom, unlike most smartphones of other brands that have the curves on the sides. Advances for which there will still be a wait. Even so, those who will not have to wait to benefit from the company's tax advantages after the approval of the tax reform on December 22 are its shareholders. Citi issued an analysis that not only reiterated its recommendation to buy the company but also ventured that Cook will increase the compensation to the company's investors.